We extend our hearts and prayers to the victims of the September 11th terrorism, their families and loved ones. May God provide them great comfort. May He guide our leaders. May He guide us. When we awoke to news of the horror, KNOM immediately joined live coverage from Associated Press. On the first day we broke away only for the Rosary, and on the days following, we added brief hourly local news and weather. This grim, live reporting occupied our air signal for sixty-one hours. For many remote listeners, including Americans stranded in Russia, we were the only source of information during this terrible time. 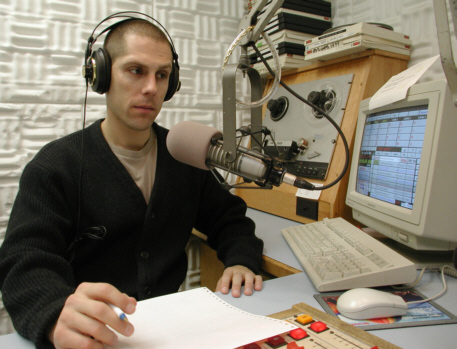 SOMBER: (left) KNOM news director Paul Korchin hosts a two-hour call-in program, inviting listeners to discuss their feelings and thoughts concerning the tragedy. Dozens of listeners expressed sorrow and mentioned that they, like most Americans, were grief-stricken and were praying. Most callers supported firm but carefully considered action, and asked fellow listeners to be tolerant of people of all faiths and nationalities. SPOTS: Within an hour of the national prayer service on September 14th, as KNOM gradually returned programming to normal, Lynette Schmidt added spots from President Bush’s and the Rev. Billy Graham’s talks during the ceremony. Listeners said the spots provided great comfort. LOSS: As you know, all mail to Nome arrives by air, and our mail service was disrupted for six days, creating an immense backup. As this newsletter is written, little mail has made it, but we have already heard from KNOM contributors who have lost friends and loved ones. From New York, former volunteer Victoria Pasquantonio called with word that several of her high school classmates remain missing. We know that you will keep all in your prayers. INSPIRATIONAL SPOT: The librarian thought things looked a little strange when she came to work one morning. A young intern the night before had sorted all of the books on the shelves according to their color. Isn’t that a silly way to categorize books? Or people? top MAY HE REST IN PEACE: With sadness, we report the death of retired Fairbanks bishop Robert Whelan, SJ. Bishop Whelan died September 15th in Spokane, WA after suffering from severe Alzheimer’s Disease for several years. He was 89. Leading the diocese from 1968 to 1985, Bishop Whelan was greatly loved by everyone who knew him. He was a kind, gentle, witty person who loved to tease. The bishop’s last time in Nome was the dedication of KNOM’s new studio building in April 1993. When we first published this photo, we failed to mention that inside the cabinet, 11-year-old Kate Busch was eating a potluck dinner, and just before the photo was taken, Bishop Whelan teasingly threatened to jump into the cabinet with her. May this great man enjoy everlasting happiness. A MOVING STORY? Maybe. Tiny Diomede (DYE-uh-meed) Island has been home to hardy Eskimo families since ancient times. It’s in the heart of KNOM listening country, less than three square miles, most of it steep mountainside, located in the Bering Strait, only 2-1/2 miles from Russian territory. It’s populated by 146 people, 121 of whom live in poverty, according to the State of Alaska. Average household income is $14,375, mostly from Alaska Permanent Fund Dividend checks. For many years, Diomeders have lived rugged lives, fishing, crabbing and hunting for polar bears, walrus, whales and seals. Many of the Diomede men are among the best ivory carvers in the world. The island is accessible by helicopter from Nome, though more than half of the weekly flights are canceled due to frequent fog and wind. Islanders also travel by small boat 35 miles to the Alaskan mainland. Most years, from about January through March, they maintain a smoothed-out runway on the Bering Sea ice near the International Dateline. Diomede’s isolation wasn’t a problem hundreds of years ago, but many of the villagers feel it today. Due to the steep, rocky nature of the island, sewer and water is not considered feasible. Increasingly, the village’s children demand western, rather than traditional subsistence food. A medical emergency may have to wait two weeks before a patient can be evacuated to a hospital. Over the summer, Diomeders voted to explore moving to a village site which they own about 60 miles southwest of the island on the Alaskan mainland. Some believe that moving would destroy the traditional nature of their lives. Others think that without a move, the village will decay. Either choice will mark great portent for these people’s futures. INSPIRATIONAL SPOT: The future is a place, created first in one’s mind and will, and then lived today. We can influence the future by how we change ourselves, our attitudes and actions. Lord, help me to live today the way that is right and holy. INSPIRATIONAL SPOT: Heaven is full of answers to prayers which no one has bothered to pray. 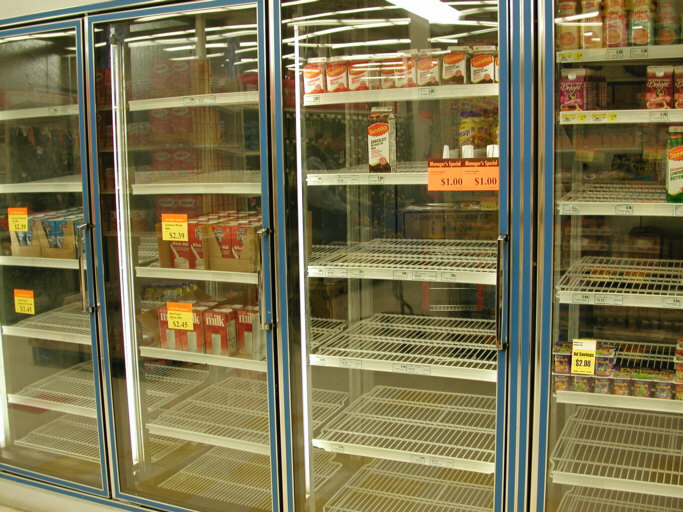 top RUNNING ON EMPTY: (left) The dairy case of Nome’s largest store was nearly empty three days after the government suspended all flights September 11th. Nome, however, did have plenty of staples, meat and canned goods. As freight flights resumed, milk was the first commodity to be shipped into town. TOPICAL: KNOM continues to broadcast news and educational programs that explore a tremendous variety of topics. The first week of September, we produced programs on inhalant abuse every day. It’s a battle we have fought for years. In the past few months, three village children have died while trying to become intoxicated, sniffing various toxic substances. Thank you for helping spread the word on these important subjects. 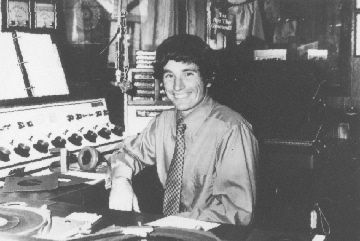 KNOM is the oldest Catholic radio station in the United States. It is entirely by your generosity that our signal beams 24 hours a day throughout isolated village Alaska. Thank you. God bless you! INSPIRATIONAL SPOT: It is through our eyes that God’s compassion looks out on the world. top THIRTY YEARS AGO: In its fourth month on the air, KNOM invited listeners to send in snapshots of themselves, trading for wallet-size pictures of the deejays. Response was tremendous. The station distributed hundreds of photos, and assembled a scrapbook of images from the villages. Before KNOM, the villages had no source of popular music except for shortwave Armed Forces Radio and sporadic night-time signals from Anchorage. And so, you can imagine that the KNOM staff were surprised to see village teenagers posing in front of posters of popular teen music, movie and TV stars. ALAP’AA! “It’s cold!” in Eskimo, pronounced ah-lah-PAH, usually with great conviction. By mid-October, Nome’s temperatures will range mostly in the +20’s. Alap’aa! LOSS: We have all suffered a great loss this past month. We thank you for remaining with KNOM, for your prayers and your contributions. We expect that for KNOM, the loss may also be a financial one. September is the month when we concentrate our efforts to find new contributors. For example, we inserted appeals in the September issue of Catholic New York. Had September been a normal month, we could have expected that this insert would have been very successful. You can imagine that many of our mailings and Catholic newspaper inserts may not bear great fruit right now as people divert their support to families of the victims of the terrorist attacks. And so, today, our mission needs your continuing support, more than ever. We cannot predict what will happen, but one thing is certain: month to month, without you, there is no KNOM. We are deeply grateful for your prayers and financial gifts. You keep this important mission alive. Our prayers continue for you, for your intentions and for those you love. Along with you, we continue to pray for the many victims, and at this critical time, for every one of God’s children on this Earth. INSPIRATIONAL SPOT: We are given many chances and opportunities to live out God’s commandments. But there will be a point in our life when we make a choice, either to be with God or to be against God. The way we live here and now is a public showing of our interior values and beliefs. Jesus warns his would-be followers not to be complacent, not to be slow to reform their lives. Rather, they need to proclaim boldly what they believe through their actions and words. Copyright 2001 KNOM. All rights reserved.